Alakazam Magic is proud to introduce Jasper Blakeley performing in character as Monrokvia's greatest mindreader and magician - Kockov. For the first time ever, the mullet-haired maestro reveals some of the mentalist routines that have helped make him a house-hold name in his former Eastern-block homeland. 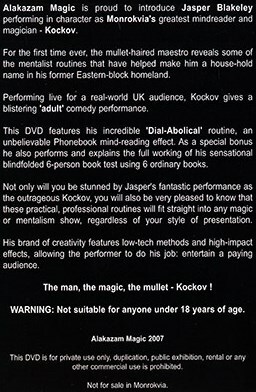 Performing live for a real-world UK audience, Kockov gives a blistering 'adult' comedy performance. 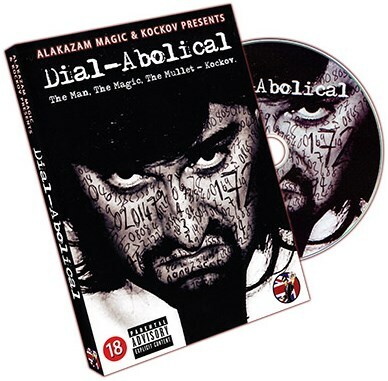 This DVD features his incredible 'Dial-Abolical' routine, an unbelievable Phonebook mind-reading effect. As a special bonus he also performs and explains the full working of his sensational blindfolded 6-person book test using 6 ordinary books. Not only will you be stunned by Jasper's fantastic performance as the outrageous Kockov, you will also be very pleased to know that these practical, professional routines will fit straight into any magic or mentalism show, regardless of your style of presentation. His brand of creativity features low-tech methods and high-impact effects, allowing the performer to do his job: entertain a paying audience. The man, the magic, the mullet - Kockov ! WARNING: Not suitable for anyone under 18 years of age.